Keith Mayerson is a painter, born in 1966 in Cincinnati, Ohio. Stuart Comer curated Keith into the 2014 Whitney Biennial, where we stood in his third floor hanging of My American Dream for this interview on May 4th. The night before our interview, I dreamt of musical interludes throughout the conversation, and in real life there were musical interludes – broad, brass instrumental sounds from the installation next door and distant vocalizations from the museum stairwell. Leland: How many years ago did you come to New York? Mayerson: Not to age myself and make my hair fall out but ‘88.5 is when I graduated from Brown and traveled around and I got here in the Fall of ’89 and I was submitting ten cartoons a week to the New Yorker. My second job was at Robert Miller Gallery when they were in the Fuller building on 57th Street and Cheim and Read were the directors. Getting to talk to Alex Katz and stepping over Basquiats and Alice Neels in the back, I realized that fine art was about bringing up ideas aesthetically just like cartoons were. With a comic, I think about a single image that’s distilled and repeated and refined over three to four frames, or maybe thirty frames. Is there a repeated image in that sense that you work with? Or a painting that you’ve made maybe five times in slightly different ways? But he appears one time here. No, three! This is the James Dean crash site here. He died when he was 24 after making only three films. As a method actor what’s really important for me about him is that he would really be able to cathect his own life into his role. I also always loved the Beatles, always feel that they were sort of the first post-modern band because they always spoke through avatars – they weren’t The Beatles, they were Sgt. Pepper, they weren’t depressed, it was Eleanor Rigby. So like a method actor, is this new for you to base your work on your own life, in the last few years? I realized there was one moment I looked around my studio and thought “You know the source images for all of these came from somewhere else. Hopefully, I’m putting my own spin on them.” Ingrid Sischy at Interview hired me to cover the haute couture shows in Paris, and they move so fast, I couldn’t be merely a sketch artist, I had to take a lot of photos. And so from those photos I ended up doing paintings that ended up in her last issue. I realized that having that connection with the images that I took was really amazing and having the autonomy of authorship, of being able to create that image, and directly work from the image that I made gave me a great feeling. They’re mostly from the last ten years, but a few earlier works – this police painting. This Jesus Christ Superstar. This circle painting. And this Ty Cash painting in the corner were from my first ten years. I’ve been exhibiting about twenty years, but you know Picasso said if you draw a circle without the aid of a compass, it’s imperfection is your style, or if you copy old masters, how it’s not like the old masters is your style. That’s what I noticed looking at them longer – a worked-over, back and forth painted mark, and I wondered, is that your primary language? Is that the way that you’ve made marks since you’ve started painting? When I broke out in the early nineties, I was appropriating different styles, via different eras. An epiphany really for me was seeing the Rembrandt Caravaggio show at the Van Gogh Museum and realizing the old masters were able to micromanage a lot and then in little pockets have their subconscious spill out. I think style to me is about painting something, or rendering something, however you render something, the best way that you can, and it comes out looking like that. It comes out like what you imagine. 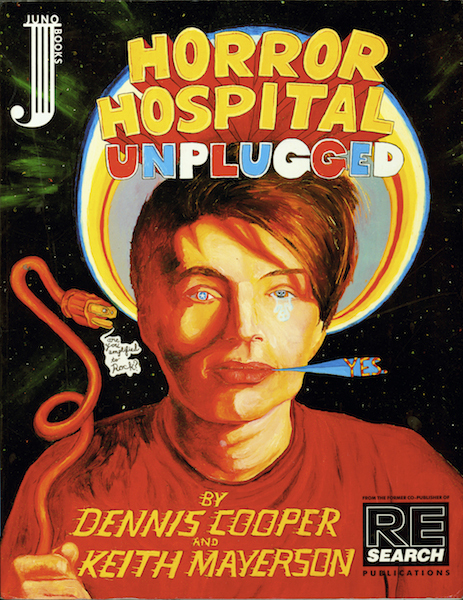 This film still was a recreation of your graphic image? Keith Mayerson, “Rebel Angel (Trevor Machine),” 2010. Oil on linen, 18 x 30 inches. Photo by Tom Powel Imaging. It’s a disregard of language, or detachment from language. Right, and of course, speaking through avatars all the time, in my own work and especially in this installation, I felt that would be a great way to begin it. 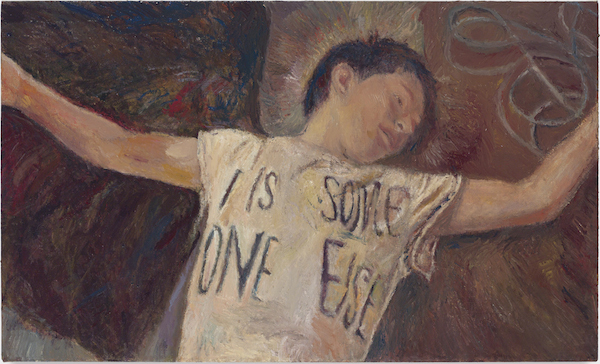 If My American Dream is somewhat autobiographical, which of course in the micro-managed narrative it is, “I Is Some One Else” begins it. 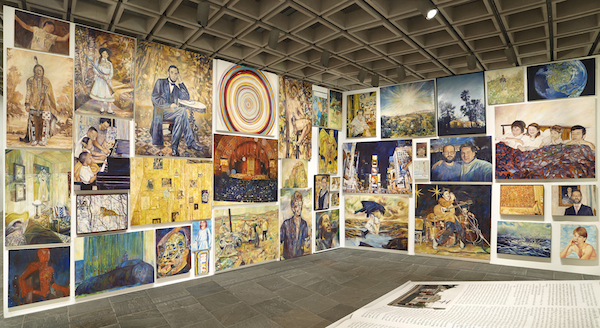 Had you always intended to hang this many paintings in the Biennial? Stuart Comer had known my salons in the past. It’s posing as a salon, but it really is like a giant comic on the wall. That’s a painting of Louis Bourgeoise, right? Did you go to her salon? 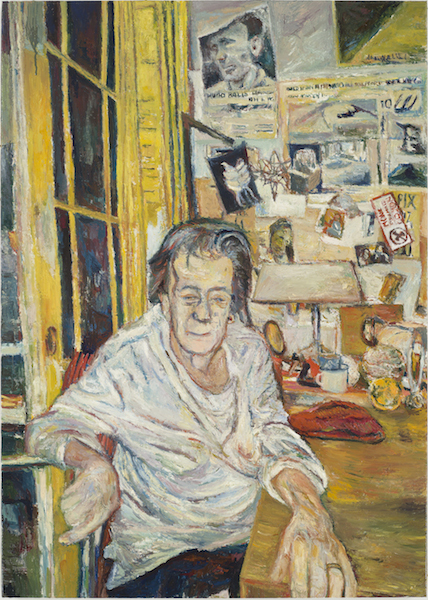 Keith Mayerson, “Louise Bourgeois at Her Salon,” 2008. Oil on linen, 42 x 30 inches. Photo by Tom Powel Imaging. Yes, I did. A bunch of times. When I was teaching at NYU, I felt like, you know, if we were alive in the 50s in Paris, we would visit Giacometti with plaster in his hair. And they were exquisitely boring kind of long days that would start at three and they would kick everybody out at seven, and they’d always be a little over warm with over warm liqueur being passed around and chocolate that she liked, but you would come up and present to her, and if she liked it, she would say “Very good,” and would send you to the moon for weeks, you know, and I would go there on my own for gratification. I asked her if I could take her photo to make a painting and luckily she acquiesced and I got to do that while she was still alive. You know, in the background is her whole cosmology. 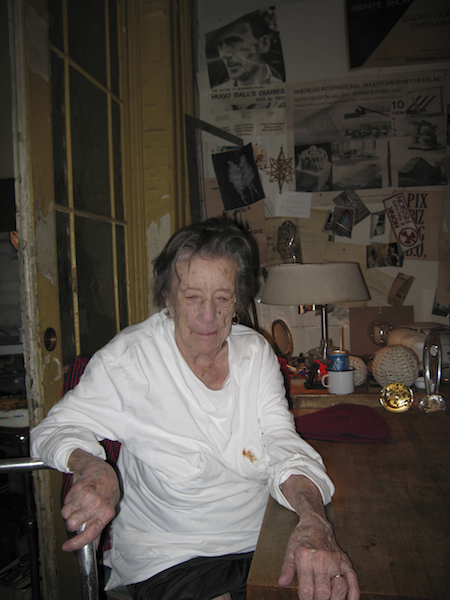 Photo of Louise Bourgeois at her salon taken by Keith Mayerson in 2006. When I first asked you for the interview, I mentioned that I was also really interested in the David Foster Wallace interview written for tennis player, Roger Federer, on the fourth floor, about Federer’s physical tactics in tennis, and I have one favorite question that he asked: “There is a thing you do at the start of service motion – you place the ball only for a split second in the fork of your racket’s throat. Are you aware of this? Do you know when you started doing it?” Is there a comparable action, a physical or personal tick, that you’ve become aware of through painting? Sure. I lay out my pallet, you know I use CMYK colors, only primaries, but a whole bunch of the primaries, light yellows and dark yellows, reds and dark reds and so on and the violets, and I want to set up a scenario where I’m looking at my photo and letting my hand go where it wants. And so, I hold my photo in such a manner that it’s almost like a music stand, where it’s right in front of me, and I find, that a lot of times my brush is almost like a brush behind the photo. I don’t perceive my hand. There’s a sense of remove. And I find that my hand is just moving, and it’s working, and it’s doing its thing, and kind of like a state of dreaming, I find myself watching myself paint. Based in New York, Erin Leland is an artist using photography, writing and video. She has recently exhibited in the group exhibition, White Petals Surround Your Yellow Heart at the ICA in Philadelphia and in her solo exhibition, Everything is Everything at Michael Strogoff Gallery in Marfa, Texas. Upcoming, a new series of photographs will be included in the group show, Psychic Panic, in Pittsburgh, opening May 16. Don’t Miss: Panel on Chicago Art Criticism TONIGHT.